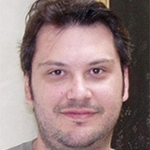 Thomas Stergiopoulos is Lecturer in Physical Chemistry at the Aristotle University of Thessaloniki. He took his PhD in dye-sensitized solar cells working in the National Center for Scientific Research Demokritos (Greece), while being a visiting researcher for one year at the CNRS-University Pierre et Marie Curie (Paris, France). During last years, he moved to the University of Oxford (Clarendon Laboratory) to work on perovskite solar cells with Prof. Henry J. Snaith under a Marie Curie IEF fellowship grant. He has about 65 peer-reviewed scientific publications, more than 2000 citations and an H-index of 27. Since 2009, hybrid lead halide perovskite photovoltaics have shown a marked rise in power conversion efficiency from ~4% to values that are almost compatible to that of conventional inorganic semiconductors. To put this in perspective, the best single junction laboratory cell (GaAs) has reached 29% efficiency after nearly 60 years of research, having started at 4% in 1956. In this presentation, we will discuss this peculiar evolution, summarizing the unique advantages of perovskites as photovoltaic materials, and will present the current state of the art.